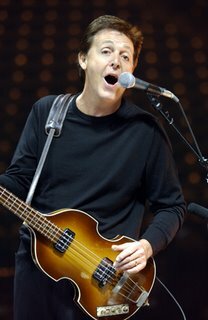 Former Beatle Paul McCartney sought on Friday to cash in on his name by registering it as a trademark for use on everything from waistcoats to vegetarian food. In addition to vegetarian items, he is also seeking permission for the name on meat, fish, poultry and game. The application has been made by McCartney's company, MPL Communications Ltd, and if successful will give it the exclusive right to use of the name McCartney on clothing, footwear, headgear and a variety of other goods. The full application specifies such disparate items as articles of fancy dress, overalls, waistcoats, hosiery, dressing-gowns, bath robes, sports clothing and swimwear. 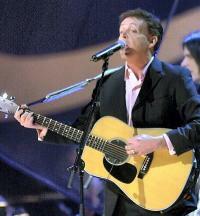 MPL Communications was set up by McCartney to handle his recordings after the break-up of the Beatles. Anyone who objects now has three months to lodge objections with the Trademarks Registry. Then a trademark judge will decide whether the marks meet the legal criteria to be registered. Companies and individuals apply to register names and logos as trademarks in order to identify the commercial source or origin of goods and services and set their business and its products or services apart from those of others. Once a trademark has been granted, its owners can take action to prevent others using identical, or even similar, names and logos. The tourists took a stroll around McCartney's grounds, videotaping McCartney's home and cars after entering the property from a public foot trail nearby, the Daily Mirror reported. The trespassers then went on to post the footage on Youtube.com. McCartney was reportedly very upset that the tourists gained access to his estate so easily, giving his staff a full dressing down and ordering them to tighten his security, the Daily Mirror said. 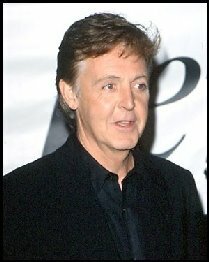 In the video posted on the Internet, the camera controllers can be heard laughing as McCartney's house comes into view. A woman's voice says: "This is it. This is his house. It's a beautiful house. It's beautiful. Oh God, we are going to be in so much trouble." The 64-year-old singer has already complained about the public trail running too close to his home, the newspaper said. 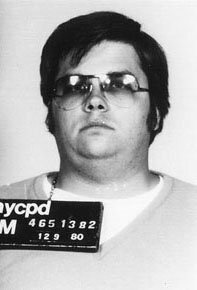 Mark David Chapman, the man who murdered John Lennon, was denied parole on Tuesday (October 10th), for the fourth time. Chapman, who is now 51, is currently serving a 25-years-to-life sentence in New York's Attica Correctional Facility, for killing Lennon outside the musician's New York City apartment on December 8th, 1980. The Associated Press reported that the Division of Parole's three-member panel met with Chapman for a total of 16 minutes. A one-page decision was later issued saying, "The panel remains concerned about the bizarre nature of this premeditated and violent crime. While the panel notes your satisfactory institutional adjustment, due to the extremely violent nature of the offense, your release would not be in the best interest of the community." Chapman is eligible for parole again in October 2008. Chapman, who was living in Hawaii at the time of the murder, stalked Lennon for days, and even briefly met Lennon's then-5-year-old son Sean outside the apartment building the day he gunned Lennon down. A movie based on the days leading up to Chapman's murder of Lennon, titled Chapter 27, will be released next year, starring Jared Leto as Chapman and Lindsay Lohan as a fan who befriended Chapman. The film gets its name from the "missing" chapter from J.D. Salinger's novel A Catcher In The Rye, which Chapman was obsessed with in the months before the murder. In an early '90s jailhouse interview, Chapman reportedly admitted to fantasizing about writing the missing chapter in Lennon's blood. Everybody needs a little love sometimes. Despite Paul McCartney's ongoing divorce battle with Heather Mills, his daughter Stella lifted the music icon's spirits on Thursday with a reassuring hug at one of her fashion shows. The former Beatle attended his daughter's debut at Paris Fashion Week and Stella returned the show of support by rushing to her father and throwing her arms around him when the pair met afterwards. Paul has been through a harrowing time since his breakup from estranged wife Heather Mills in May and the strain of heading to the divorce courts has been "devastating." Stella, 35, dedicated the show to her "mum (sic) and dad" - her mother was Paul's first wife, Linda, who died in 1998 after a lengthy battle with breast cancer. In a handwritten note, Stella wrote, "This show is dedicated to my husband and son. It is also for my mum (sic) and dad." Heavily-pregnant Stella, who has an 18-month-old son Miller with husband Alasdhair Wills, was thrilled to see her proud father filming the standing ovation at the end of her ready-to-wear collection showcase. Sitting in the front-row, Paul insisted, "It was the best show. Not that I'm biased!" The 64-year-old musician, who has a two-year-old daughter, Beatrice, with Heather, confessed he was struggling to cope with his marriage break-up. He said, "It's been the most terrible time for me and my family. Coming to terms with this is horrible." Meanwhile, Heather looked gloomy as she flew to the U.S. on Thursday. The 38-year-old former model refused to comment when quizzed about her alleged demands for $254 million divorce settlement. The directors of the new documentary The U.S. vs. John Lennon found a key piece of archival footage only weeks before the film was scheduled to wrap production. The film, which was released last month, chronicles Lennon's four-year fight to legally remain in the U.S. For years, the footage of Lenon and wife Yoko Ono appearing on July 27th, 1976 at the Department of Neutralization and Immigration in New York City was thought to have been lost forever. David Leaf, who co-directed the film which documents Lennon's harassment by the Nixon administration, told us that the footage was discovered during the production's eleventh hour: "You know, we had interviewed people who were there and they had told us what John said outside the building, but to find John saying that, it's so impactful. You know, he thanks his fans, he makes the classic comment, 'Time wounds all heels.' We found that three weeks before we finished the movie. It was in a mismarked reel." The footage of Lennon was shot for WABC-TV in New York. The U.S. vs. John Lennon, which was produced with the cooperation and participation of Yoko Ono, is in theatres now. A "new" album of Beatles music mixed by their legendary producer George Martin and described as a new "way of reliving the whole Beatles musical lifespan", will be released in November. EMI Music and Apple Corps Ltd said on Tuesday that Martin and his son Giles began work on the album, called Love, after getting permission from Paul McCartney, Ringo Starr, and Yok Ono Lennon and Olivia Harrison representing John Lennon and George Harrison. The music has already been used as the soundtrack to the theatrical Cirque du Soleil show called Love. "This music was designed for the Love show in Las Vegas but in doing so we've created a new Beatles album," George Martin said. 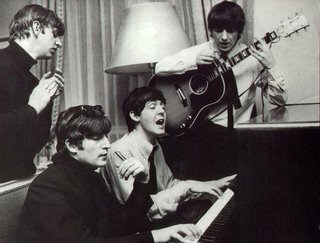 "The Beatles always looked for other ways of expressing themselves and this is another step forward for them. "What people will be hearing on the album is a new experience, a way of re-living the whole Beatles musical lifespan in a very condensed period." The Martins worked from the original master tapes from the Abbey Road studios to produce a medley of Beatles music by remixing favourite songs, such as Harrison's Within You Without You being played to the drum-track of Tomorrow Never Knows. 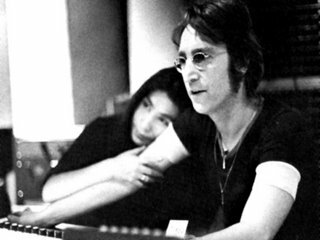 The fashion designer Jenny Kee has disclosed that she slept with John Lennon when she was 17 after the singer declared that he had never been with an Asian girl. Kee, 59, famous for her use of iconic Australian imagery on creations that range from jumpers to bedspreads, writes of the encounter in her memoir, A Big Life, which goes on sale on Monday. She says she also slept with Keith Richards, Eric Clapton and Roger Daltry but denies she was “a hardened groupie”. The designer, whose creations were worn by the late Diana, Princess of Wales, said that she slept with Lennon in Sydney during The Beatles’ first visit to Australia in June 1964. Lennon was still married to Cynthia, his first wife. 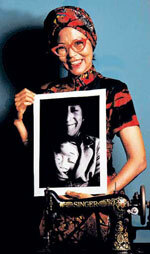 He began the affair with Yoko Ono, the Japanese musician and artist, in 1968. Asked by Australia’s Who magazine how she ended up in Lennon’s bed, Kee replied: “You’ve got to have a strategy. There was wall-to-wall security, but we pressed all the buttons in the lift until it jammed, and that’s how we got on to the stairwell and met them. Most of Kee’s encounters with rock stars occurred in London after she moved there in the late 1960s and worked at the Chelsea Antiques Market, where she claims to have frequently dressed, and, it appears undressed, well known musicians. Kee went on to design for Karl Lagerfeld and Chanel. In her later life, back in Australia, she lived with Danton Hughes, son of the Australian writer and art critic, Robert Hughes. Danton Hughes, who was 20 years her junior, committed suicide in the Sydney home he shared with Kee in 2002. He was convinced, Kee says, that his father, Robert Hughes, loathed the sight of him. Robert Hughes did, allegedly, disapprove of his son’s relationship with Kee. In his own memoir, Things I Didn’t Know, which is also about to released in Australia, he refers to Kee as his son’s “far older” lover. In turn Kee, in her book, remembers Hughes Sr, whom she knew well in London in the 1960s, as an “arrogant, pompous, generous — and upwardly mobile hippy”. Let’s get one thing straight. 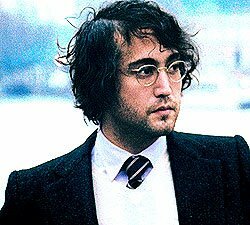 Sean Lennon has absolutely no problem with who he is. One is immediately struck by Sean’s voice. It bears a strong American accent but is shot through with the familiar, distinct nasal lilt of John Lennon. He feels the records give him a relationship with his father that otherwise wouldn’t be there because, of course, “he’s not around”. 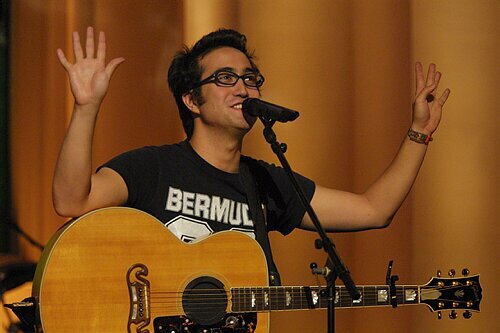 It’s touching to remember that when John sang to his “beautiful, beautiful, beautiful boy”, the world shared his joy. His simple heartfelt ode from besotted dad to “darling Sean” appeared on Double Fantasy, the album he made with partner Yoko Ono in the summer of 1980. He grew up in John’s adopted home city of New York with mum Yoko and these days is part of its glamourous social whirl. While sharing his parents’ love for music, the million-dollar question has been whether he would plunge into the business big time. Happily, I can report that if his debut album, 1998’s Into The Sun, represents a flirtation, Friendly Fire feels like a full-on commitment. 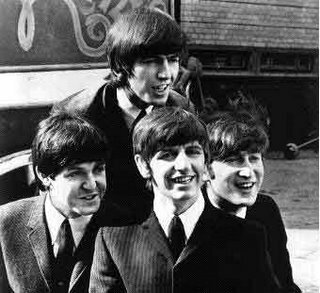 Now, however, he’s even approached and subsequently joined The Beatles’ first label (Capitol in The States and Parlophone here). “It’s a big step. I’m older and I think I’ve gotten better at music. This record is also technically better and has a much richer sound. Capitol/Parlophone seemed a more appropriate label for the kind of work I’m doing now. I’m not a kid any more so I’m not trying to say, ‘Look how weird I am’. I’m trying to make beautiful art. It’s going to be a different career for me. Yet he did give this insight: “I remember playing a show in Rhode Island as a kid and there were three fat pigs in the front row with Beatles T-shirts on and one shouted ‘Play Yesterday!’ He said it in the middle of me singing and I thought, ‘This is what everyone’s talking about’. Friendly Fire is a special album. The ten songs are personal, revealing and grand in scope. Rather like many of his dad’s solo efforts, there’s a dreamlike, often childlike quality. A key song is the title track, on which he lays bare his feelings about his split from singer-actress Bijou Phillips. Did it bother him to share his innermost feelings with the listening public? “I have to say that I never have issues with putting out songs that are personal. I have this innate thing that I don’t care. “What bothers me is when people don’t know how I feel but are looking at me anyway. That’s what makes me uncomfortable, being in the public eye. People are projecting this idea on to me, like, ‘I hate that Lennon kid. He should be like his dad’”. Another great thing about the album is that ever-visual Sean has shot an accompanying film featuring all the tracks, to be released on the CD/DVD edition. When you “see” the songs, everything clicks into place. Each song gets a different, slightly surreal setting, though perhaps not as surreal as mum Yoko would have liked. Sean says: “She was a producer and gave me advice. For a while she thought I was being too commercial but I think she loves it now. The film for opening song Dead Meat sees Sean cheat at cards and get involved in a duel. The message is that you get what you deserve in life. He says: “When I wrote Dead Meat, I knew I had a record. It represents how my life felt at the time. A dazzling fairground ride, a rollerskating venue, a dishevelled apartment, an underwater scene and a freak show circus all feature in the album film. “It was a roller coaster,” says Sean. “It was difficult because we only had 12 days to shoot the whole thing. We were on a shoestring budget. “We’d do a piece one day, have three hours’ sleep and come back the next morning to a different set and have a completely new set of characters. The sense of sonic and visual adventure pervades all on Friendly Fire, none more so than on the film for Headlights, which has a similar feel to Ken Russell’s portrayal of The Who’s Tommy. Sean reveals: “It was one of the easiest ones. We just had to rent this fairground ride called a Gravitron. It spins round and you stick to the wall. Finally, we return to a subject so close to Sean’s heart — John Lennon and The Beatles. Is he bothered what the people who have a close relationship with their incredible music think of him? “I understand that because they’re so attached to that great music that they don’t want me to f*** with their relationship with it or mess with their idea of this perfect thing. When Sean’s album goes on sale next week, my advice is: Take it, don’t leave it.